Above is Loligo opalescens showing the major internal organs. Loligo sp. feed on shrimp and fish. 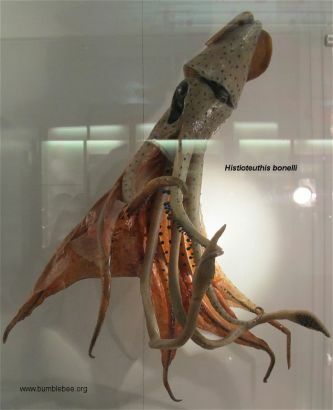 Histioteuthis boniellii, the Umbrella squid, above, is found in the Atlantic and Indian Oceans, and in the Mediterranean Sea at 400 - 500 m deep. Its eyes are of different sizes, and it is thought that it uses the larger eye to look up to spot prey silhouetted against the light, while the smaller eye can detect the glow and flashes of light emitted from light organs on other animals. Its own smaller eye is ringed by light-emitting cells, so could be used rather like a search light. This squid is preyed on by whales. 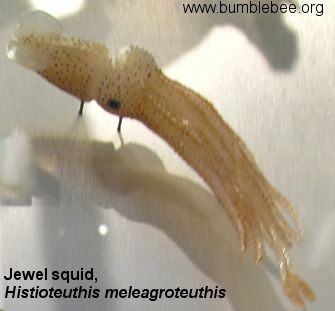 The Jewel squid, above is found in tropical and sub-tropical waters. Above and below is the vampire squid, Vampyroteuthis infernalis. It lives in tropical and sub-tropical oceans in water between 700 - 3 500 m deep, and is purple/black in colour. There is no light at this depth and very little oxygen. It has blue blood, and this enables it to transport oxygen more efficiently than other cephalopods. It has light emitting organs (photophores) on its body, and these can flash for second or minutes. Its arms are joined by a web of skin. The photograph below shows the prey's eye view, but what cannot be seen in this photograph is its jaws which are located at the top of the bell formed by the webbed arms. The jaws are white.. It can grow to 30 cm long, and its eyes are relatively large at 2.5 cm diameter. It does not have a defensive ink sac, but can eject a cloud of sticky bioluminescent mucus which continues to emit light for 10 minutes. I imagine that this is a much more useful defence in the dark. It is a very fast swimmer moving through the water by flapping its two front fins, and feeds on copepods, prawns and Cnidarians. It can also move using jet propulsion, and this is how the juveniles move as it is only in the adults that the fins are large enough to be effective. 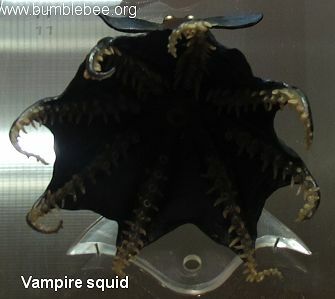 Its Latin name translates as "vampire squid from hell"! More recently this squid has been compared to bankers. This, I feel, is unfair to the squid. It is true that both eat prawns, but only one has managed the seemingly difficult task of eating our future prawns, and getting us to pay for them as well. Prawns today, prawns tomorrow (apologies to Lewis Carroll). Any bankers who disagree can do so through the donation page. Bathyteuthis abyssicola, above is found in all the oceans of the world between 700 - 3000 m deep. Its colour is a very dark red. Mastigoteuthis flamea, whip-lash squid (above) is found in the North Atlantic and around New Zealand at depths of 700 - 3500 m.